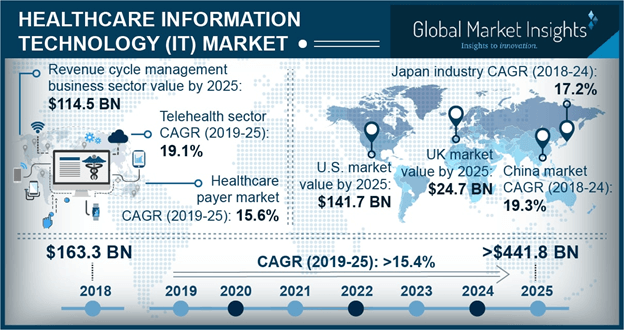 Healthcare IT Market size is set to exceed USD 441.8 billion by 2025; according to a new research study published by Global Market Insights, Inc. Favorable government initiatives for encouraging adoption of information technology in healthcare services will boost industry growth in the future. For instance, the U.S. government passed Health Information Technology for Economic and Clinical Health (HITECH) Act, providing funds worth USD 20 billion for setting up electronic health records. Such government initiatives should propel the Healthcare IT market growth. UK healthcare IT market is estimated to reach USD 24.7 billion by 2025. Rapid adoption of healthcare IT services in UK along with superior accessibility of information technology infrastructure will render positive effect on UK healthcare IT market. Rising number of chronic diseases and technological advancements in the country will favor market growth in the upcoming years.